As I studied this passage, I was convicted how easily I can become entangled in a civilian pursuit, namely, watching too much sports on TV. Some of you are clucking your tongues at me because you could not care less about sports. Not so fast, friend. Maybe you get entangled in the latest movies or TV shows. Or in checking Facebook 64 times a day. Or in talking on the phone for hours while you should be doing other things. Whatever our “entanglement du jour” happens to be, each one keeps us from effectiveness on the battlefield. If the soldier is marked by obedience, the athlete is marked by determination. During the decathlon competition of 1974 between the U.S., Poland and the USSR, a friend of the U.S. coach asked him, “Who is the best athlete on our team?” The coach pointed to a slender man, muscular and athletic-looking. The friend asked, “Will he win today?” “No,” the coach replied, “that young man will win.” He pointed to another athlete. “He’s going to win because he has the strongest will to win. 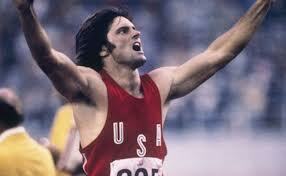 He is the most mentally tough competitor I have ever seen.” Sure enough, Bruce Jenner went on to win that competition, and then to become the gold-medal decathlete in the 1976 Olympics.